We moved to Motherwell at the beginning of February 2012 to work for Tilsley College which is part of Gospel Literature Outreach. Dorit is responsible for the daily administration of the college and Simon is Principal. 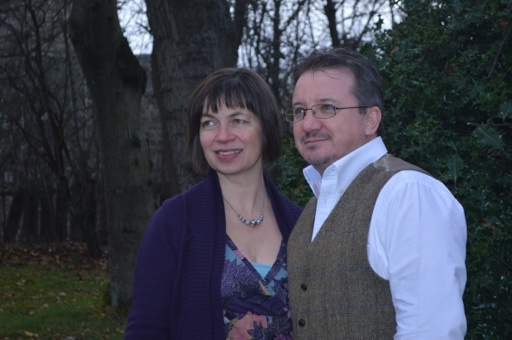 We are members of Bothwell Evangelical Church where Simon is an elder and has a regular teaching role. Before Motherwell, we were in Prague and worked for the International Church of Prague. Dorit was again responsible for church admin, and Simon was Director of Studies of the ICP Study Centre. ICP is an English-speaking church in one of the most beautiful cities in the world and serves mainly the ex-pat community in the Czech capital. Its members come from over 40 different countries and the church exists to be a radiating centre for the gospel, not just in Prague but further afield. Prior to moving to Prague, we lived in Exeter, where Dorit was working for the Rural Payments Agency and Simon was pastoring Beacon Heath Church. BHC is on an ex-local authority estate in the north of Exeter and celebrated 50 years of service to the area in 2011. Our two children, Robert and Kristina, both still live in Exeter, where they are married and active in their local churches. Our first grandchild, Zoe, was born to Robert and his wife, Lucy, in December 2012; our second, Daniel, to Kristina and her husband, Jonathan, in June 2013; and our third, Reuben to Rob and Lucy in October 2014. Dorit comes from the Faroe Islands and we spent ten years of our married life there; both our children being born in the capital, Tórshavn. Dorit did various jobs, and spent a few years as full-time homemaker. Simon worked at a school (website in Faroese) teaching English and French. Between our time in the Faroes and that in Exeter, we spent three years working at Hebron School in South India. Dorit enjoys knitting, sewing and walking while, apart from an interest in theology and literature, Simon is a big fan of Bob Dylan and of cricket!